NETWORK FINALS: THURSDAY NIGHT FOOTBALL adjusted to 4.7, up 1.5 from last week’s game. CABLE HIGHLIGHTS: NFL Network’s share of THURSDAY NIGHT FOOTBALL was at 1.04, up 0.29 from last week’s game. On MTV, JERSEY SHORE ticked up to 0.77, and HOW FAR IS TATTOO FAR? was at 0.33/0.31, steady with last week. TNT’s NBA doubleheader was at 0.62 for Golden State vs. Milwaukee, and 0.40 for Houston vs. Oklahoma City. MSNBC’s RACHEL MADDOW SHOW led cable news at 0.39/0.56/3.2M, with Fox News’s HANNITY at 0.29/0.53/3.5M, and CNN TONIGHT at 0.24/0.33/1.3M. On A&E, LIVE PD: PD CAM was at 0.32/0.26 compared to last week’s 0.36/0.34, and LIVE PD: POLICE PATROL was at 0.29/0.28. Bravo’s SHAHS OF SUNSET gained 0.04 to 0.31. 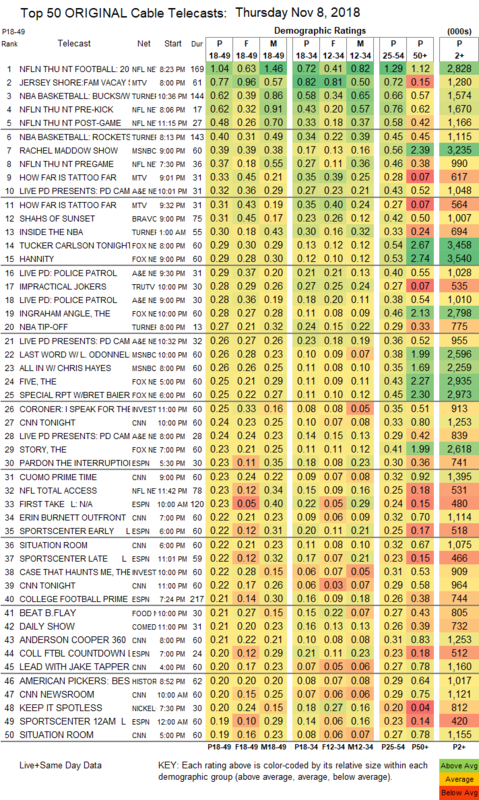 Tru’s IMPRACTICAL JOKERS ticked up to 0.28, and AFTER-PARTY was at 0.17. On ID, THE CORONER was steady at 0.25, and THE CASE THAT HAUNTS ME ticked down to 0.22. Food Network’s BEAT BOBBY FLAY edged up 0.02 to 0.21. On HGTV, FLIP OR FLOP was at 0.19 compared to last week’s 0.19/0.18, HOUSE HUNTERS lost 0.03 to 0.14, and HOUSE HUNTERS INTL was down 0.04 to 0.13. We’s GROWING UP HIP-HOP ticked up to 0.18. 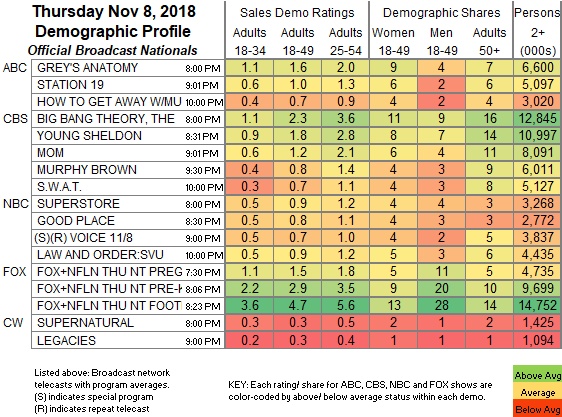 On History, AMERICAN PICKERS was at 0.17, and THE RETURN OF SHELBY THE SWAMP MAN dropped 0.04 to 0.16. POP’s IMPACT WRESTLING ticked up to 0.05. IFC’s BARONESS VON SKETCH returned at 0.04 and 0.03/66K.